Written one lonely Christmas eve after my wife had left me, the kids were away at school and I was home alone. . . Many many years ago I used to bake bread now and then. I never used a recipe but have used the Joy of Cooking as a guide. Making bread without a recipe was sort of a self challenge. Consider how many millennia people made bread before writing and measuring cups. Of course from daily practice it is hard to forget. . I was telling Kiwi about my bread making and that I might do it for Christmas. Then I looked for ingredients and backed up. . Well, tonight. . . I looked in the "Joy of Cooking" to refresh my bread making skills. . In the yeast bread section I found an old recipe card my wife had typed up some 20-25 years ago. 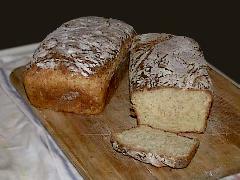 "Jock's Christmas Bread". It lacks details. . . and flour was added later. . . It requires cake or live yeast. What I found in the fridge was was a month older than the expiration date and a little moldy. . . You add cake yeast to sugar and it "wakes up" and immediately starts fermenting. The moldy block was a little lethargic so I added the second block to the sugar. It seemed more "alive" and now I feel better about success. Had to go to the store for eggs and honey. Twas a good excuse to buy some more beer. I don't usually drink much but its Christmas and my wife has left me. Anvilfire and other problems are the heart of our issues. So, I'm doing something I haven't done in 20 years. . . Making bread (the little Millers will last a week). The oats are boiling . . . recipe next, but I've got ingredients to mix first. An inauspicious start: In the time it took to type a couple sentences I burned the oats. . . nonconductive insulator does not dissipate heat well. . . Will restart when the pan is decarbonized. . . One of the areas that my wife and I disagree about. I rarely burn things while cooking. She has made it a fine art. I believe that cooks that burn food to dish need to clean it up. . . and perhaps learn to stop burning things. Oatmeal is not something I normally cook. . . Never saw anything burn like that! Mix 1 cake yeast with tablespoon sugar. Boil 2-1/2 cups rolled Quaker oats in 4 cups water 5 min. Caution, burns easily. Mix 1 cup milk, 1 egg, 1/2 cup honey, 1 tbsp salt. Punch down, divide into loaves and place in greased and floured loaf pans. Bake at 375°F for 40 min. Seat of the pants Cooking: This recipe often had whole wheat flour used. However, using whole wheat is tricky and it should be mixed with some white all purpose flour OR have baking gluten added. I added the boiled oatmeal too soon (too hot) and it looks like it cooked the egg . . So I'm adding another egg when I add the yeast and flour. I probably should append the recipe to let the oatmeal cool before adding to anything. . . (done). For all of you in NZ and Australia and other places South of the Equator "winter solstice" bread might be best. . .
As promised, photos at 11:00. Merry Christmas all! And the bread looks delicious. send slice or loaf and I'll do QC for you. Well Guru I must say that bread looks great! I'm a bit of a yeasty (get it?) fellow myself. Hope thing look up for you, hang in there, we're all pulling for you. Thanks for sharing with us over the past years, remember the good times, forget the bad, and look for the future to improve for all of us. Have a beer for me, I say a toast for you in the morning. Sleep well my friend, and may all your gifts bring joy. Thanks for anvilfire. Without it I would never have made the great strides I have in the art of Blacksmithing. Looking foward to another great year of this web site. And much thanks to all who contribute and share their knowledge. This bread is NOT a recommended nutriant dense recipe despite the large amount of oats. But it is MUCH better than common bread. To make the recipe healthier substitute No-salt Salt (potassium chloride) for the salt, use Silk Almond Milk for the milk and 3/4's whole wheat flour or all whole wheat flour plus baking gluten per the package instructions. Frescos del Frutus - Batidos or Licuados Low calorie desert drink.